A dramatic day 1 to Rally Finland. Ogier was fastest on the first (Mickey mouse) stage of the rally. 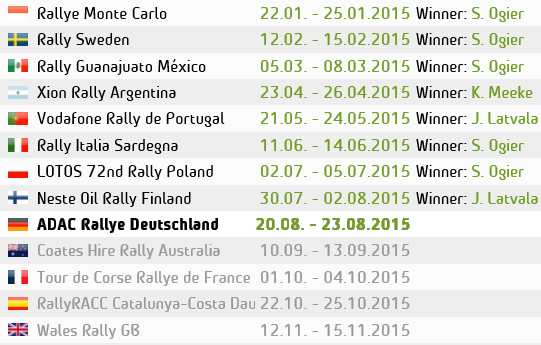 But on the next 3 stages, something that has never been seen before in the WRC, 2 drivers shared joint lead. SS2 it was Neuville and Fin, Mikko Hirvonen who both took the lead of the rally. On the following SS3 stage, the first of the ‘proper’ Forest stages and it was Neuville and Ogier who shared the top spot of the leader board. Then on Stage 4 Neuville continued to hold the leader but once again had to share it with flying Fin Mikko Hirvonen. With Ogier in 2nd. On SS3 VW’s Jari Matti Latvala came wide over a crest and hit a rock, damaging the right rear wheel resulting in broken suspension. After trying to fix it, the Fin had to retire from the rally. With the rally lead tied it was onto SS5 Himos. Where the heavens opened and the rain turned the gravel to mud. The worst affected was Hirvonen who lost 12 seconds and dropped to 5th place. Now Qatar M-Sports Neuville leads rally Finland with team mate Ostberg in 2nd place. A great day for the Ford boys. 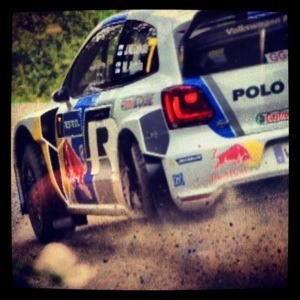 2.5 seconds behind them is VW’s Seb Ogier who said he has had one of the most “Boring” days rallying. The Crews now on their way to the final super special stage of the day, Killeri.